"When you're dealing with the story, when you've got the characters that you love, when you've got the new characters sliding in next to them - it's very exciting. Then I don't feel pressure, then I feel like I'm reading my favorite comic. I've got these two characters, two of my favorite characters from the comic book, a brother-sister act, they're in the movie. That's exciting! You lock certain things in, there's a fluidity." He told this to Yahoo News, who recorded him saying it, so this is real, folks. This is happening. If there's another set of siblings at all related to the Avengers besides Quicksilver and Scarlet Witch, I am unaware of them, but I think we all assumed that the two superheroes, being the children of Magneto, were locked up as part of Fox's X-Men movie rights. So what does this mean? Is this the beginning of a new partnership between the two movie studios, perhaps facilitated by Fox's new Marvel czar Mark Millar? Could we see a crossover between the Avengers and the X-Men in the future? 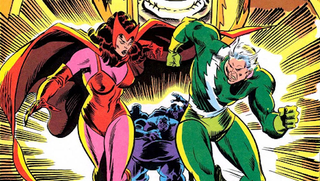 Could the Avengers movie versions of Wanda and Pietro simply not be the kids of Magneto, to keep everything separate? Or would Whedon just not mention the duo's father, hoping things between Marvel Studios and Fox get worked out by Cinematic Phase 3? I'm guessing the last one, but who knows? Well, Joss Whedon does, but he ain't telling.